Raagam was directed by Bhim Singh. (he was a close friend of Salilda and the husband of Sukumari, a well known Malayali actress who has her name in the Guinness Book for acting in the largest number of films in this world. 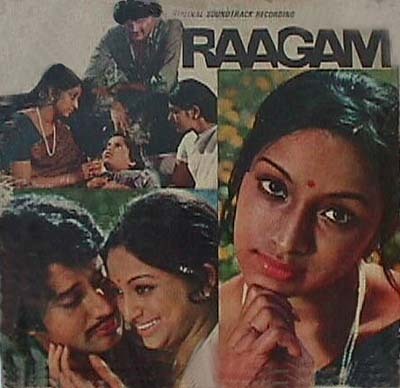 "Raagam" is actually a complete copy of Shaki Samant's very successful Hindi film "Anurag"(1972). Songs of 'Raagam' have been available in records, cassettes and lately on a CD along with three other malayalm films - Chemmeen,Nellu and Rasaleela. However, the sixth song 'Guruvayurappan' doesn't appear in the cassette or the CD. Rumour has it that due to some inconsistencies in the lyrics the song was deleted from the film. It only appears in a record which is nearly impossible to get and makes it another rare collector's item.